A renewed gallery for a new year! It's time for TokuNation to take it's Gallery 2.0 do-overs to the next level! Taking a look back at our archive of old galleries we thought that with the premiere of Power Rangers Dino Charge upon us it would be the opportune time to go back and give Zyuden Sentai Kyoryuger the TLC it deserves. So without further delay we now present S.H. 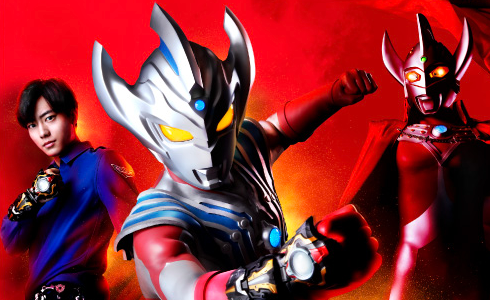 Figuarts Kyoryu Red (Gallery 2.0)! Kyoryu Red comes in quite the interesting box. Though Sentai Figuarts haven't been around nearly as longs as Rider ones, they initially started out with the same boring box design. But in recent years Bandai's really gone all out, Kyoryuger figuarts are no different. Not just a simple window box, Kyoryu Red's really tries to evoke the general look and feel of his costume, right down to the "sash" across the window. The back of the box is also pretty snazy to just be a selection of stock photos. I mean honestly the Kyoryuger Boxes were some of the nicest sentai figuarts packaging for their time. As with any time a new Sentai Figuart is release, Kyoryu Red is an entirely new base body. And wow what a nice one it is. The Kyoryuger designs are some of the more busy modern sentai suits we've had in a while, and I mean that in a good way. Luckily the busyness, in fact the more armored nature of this costume, lends itself that much more to being a toy. Where Riders Metal Heroes & the like have the advantage of armored costumes and less apparent articulation cuts, sentai costumes are basically fabric. So reproducing that in articulated toy form can be difficult. But Kyoryu Red really pulls off his look quite well. The lower half of the body is simple stuff. Come up to the belt though and look at the glorious detail on the Mobuckle. It's hard to see at that scale but the Kyoryuger emblem and even the eyes on the sides of the buckle are fully painted. 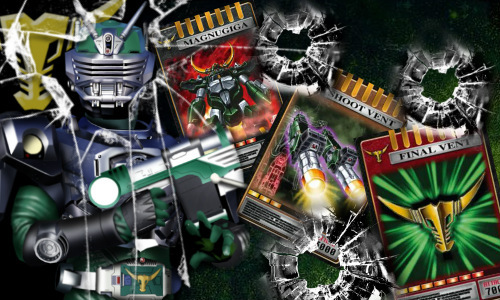 The Mobuckle can also rotate to the side to simulate what happens when a Zyudenchi would normally be removed from inside. At this scale though they couldn't engineer the Mobuckle to open and store them. But that's okay as the included Zyudenchi is tiny. Further up brings us to the exquisitely molded arm details. Rather than go for a fishnet style paint job on the arms to get the scaly feel of the costume, Bandai has instead sculpted the detailing into the arms themselves! Thus creating a much more polished look that works better than I ever thought it would. The chest and head though are where the figure knocks it out of the park. As I said the more armored nature of the figure lends itself well to the toy makeover. The chest emblem, sash, shoulder, & back are all gloriously detailed and fully painted. The Gabutyra emblem in particular looks great. The head while well sculpted could stand to be painted just a little bit better. The front and back halves of it appear to actually be different colors under the right light. A minor gripe but one none the less. Otherwise it's dead on the show suit. And as for posability, well see for yourself below. Kyoryu Red can assume any of his iconic poses with ease and pretty great balance as well. The shoulder armor doesn't impact articulation either thanks to the hinge on the pad. So this guy has great open ranges of movement at his disposal. 1 - Generic Zyudenchi. Though by association this should be Gabutyra's Zyudenchi, it simply isn't painted correctly. Though to be fair none of the 6 Kyoryuger Figuarts have Zyudenchi with entirely accurate colors. But that's mostly because at this scale it's nigh impossible to paint properly. So some general colors are slapped on so you get a feel for it. Again this thing is infinitesimally small and I won't use it for anything again ever. I'm fine with it being kind of generic. 1 - Gaburicalibur. Again this is a wonderfully detailed piece. Right down to the most minor details this is a perfect recreation of the show prop. Again it does not open or accept batteries and I'm totally okay with that. What I'm not okay with however is that the Gaburevolver & Gaburicalibu do not combine into the Gaburicannon. Nor is a separately molded version of it included with any figuart. If a Kyoryu Violet is ever made it would almost certainly come with him/her as it was used quite often by the second (female) Violet. 3 - sets of additional hands. For your general needs. You get one set of Revolver hands, one set of Calibur hands, and one set of splayed out roll call pose hands. 1 - Armed On Arm. A great inclusion here is the option to display your figure as Kyoryu Red Armed On. To use this you need to (pretty forcefully) yank out his right arm at the shoulder socket. Then plug this one on. I've found this to be infuriatingly difficult to do with. Most of the time I can get it more or less on but can't always get that last "click" to lock it into place. But when you do, and then the arm stays up properly, the look is very satisfying. 1 - Gabutyra Fang. A complimentary piece to the Armed On Arm, the Gabutyra Fang is Kyoryu Red's Armed On weapon. Another beautifully, almost cartoonishly, sculpted piece that looks like it walked right off the set. It fully replaces the fist of the arm you plug it onto but it shoulder primarily be used on the the right Armed Arm. The jaw opens and closes and is on a nice tight joint so you can display it open if you so choose. While this Fang can't combine with the other Kyoyuger weapons into the Kentrospiker, a version of the Gabutyra Fang is included with S.H. Figuarts Kyoryu Gold. That one comes already combined as the Fang Shot, and the Shield Lanslasher combo comes with Kyoryu Black & Pink. So thankfully you have the option to have both a completed Kentrospiker and all 5 individual weapons displayed separately if you so choose. The short of it is that S.H. Figuarts Kyoryu Red comes with almost everything he could possibly need. Gaburicannon issue aside this guy is perfect. It's a near spot on representation of the actual suit, it's incredibly detailed, can pose like nobody's business, and will look fantastic joining the ranks of your other toku heroes. Oh and he's of course compatible with the Deinochaser! Seriously do yourself a favor and pick up Kyoryu Red, he's on sale on most sites for anywhere from 2000-3000 yen and will not be imported to the US by Bluefin. This one comes highly recommended. What's the green slash effect from? A McFarlane Star Wars Unleashed Luke Skywalker. Is that silver guy Deluknight? I almost thought Riser Shirogane and then remembered Akibaranger. Great pics, those effect parts add a lot to the pictures. Geeze, I might have to pick this up! You tout him so highly. On the other hand: MY GOD, I've never seen this Deluknight before!! I love him, and within two seconds of searching I find he's not being offered on amazon or ebay. That thing is gona drive me insane - I WANT IT.